1. In Central Administration, click Application Management. 2. In Service Applications, click Manage Services on Server. 3. On the Services on Server page, locate the Distributed Cache service. 4. If the Distributed Cache service is started and you want to stop the service, under Action, click Stop. If the Distributed Cache service is stopped and you want to start the service, under Action, click Start. SharePoint 2013 introduces a new concept called Distributed Cache. The Distributed Cache service, which is built on Windows Server AppFabric Cache, is set to run in a collocated mode on all SharePoint 2013 Servers by default, using up to 10% of the server's total physical memory. It’s essential for maintaining the large amounts of information on your SharePoint Server, ensuring that the information is fresh and readily available for the end user. Caching functionalities, provided by the Distributed Cache service, enable the SharePoint features listed above to quickly retrieve data without any dependency on databases stored in SQL Server, as everything is stored in memory. The /SharePoint/ segment of the URL is added by SharePoint during registration process, you should not add segment to your registration URL. This example assumes that a managed account for DOMAIN\ManagedAccount already exists. - and starts the service instance on the local machine. 1. Open IIS Manager. 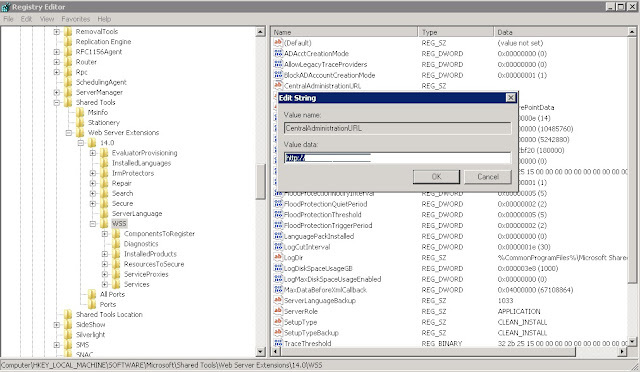 For information about opening IIS Manager, see Open IIS Manager (IIS 7). 2. 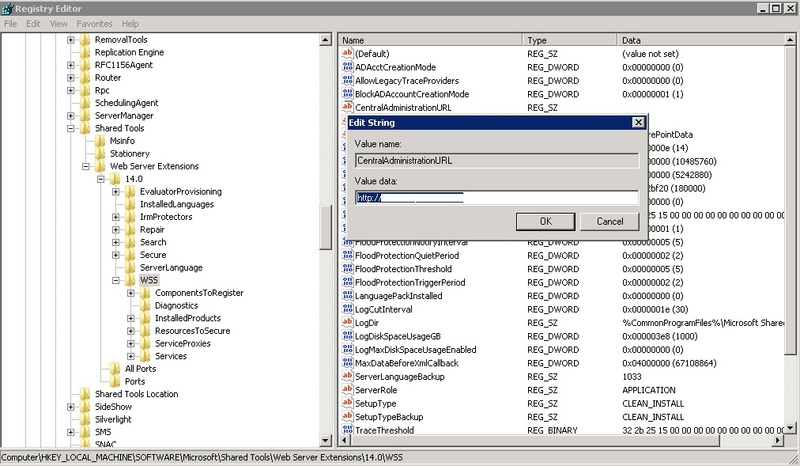 In the Connections pane, click Application Pools in the tree. 3. Type "appcmd list apppool"
2. Type Notepad in the search field, Right-click Notepad and select Run as administrator. 4. Make the required entries to the file. 5. Click File -> Save to save your changes. You need to be a site collection administrator to set this property. I was already the site collection administrator to the site and it did not make any sense. On further trouble shooting, I found the solution for this.Browse to Central Administration - > Site Collection Quotas and Locks. 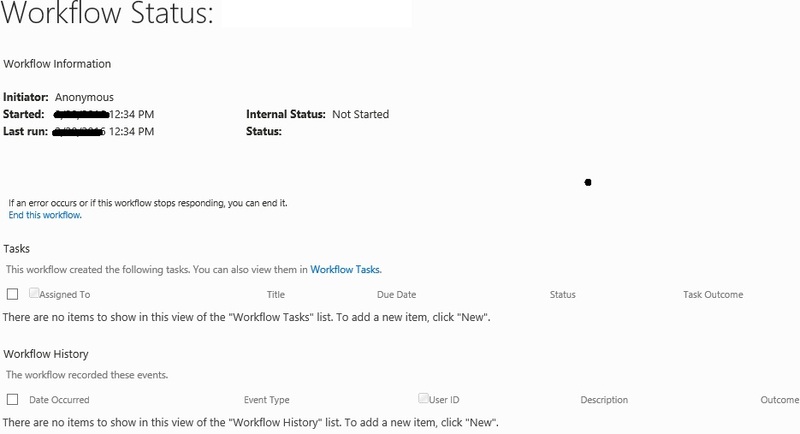 Workflow created using SharePoint designer is not getting started and the initiator is Anonymous. Recently I ran across an issue where a SharePoint Designer workflow associated with a list was showing the below symptoms. It was a simple list and a basic workflow sending an email. Make sure that the source and target SharePoint farms are in the same SharePoint build versions. Query suggestions are phrases that you want the search system to suggest to users as they start typing a query. For example, as you start to type "Chicago", they may be able to pick a word that starts with "Chicago" from a list below the Search Box. 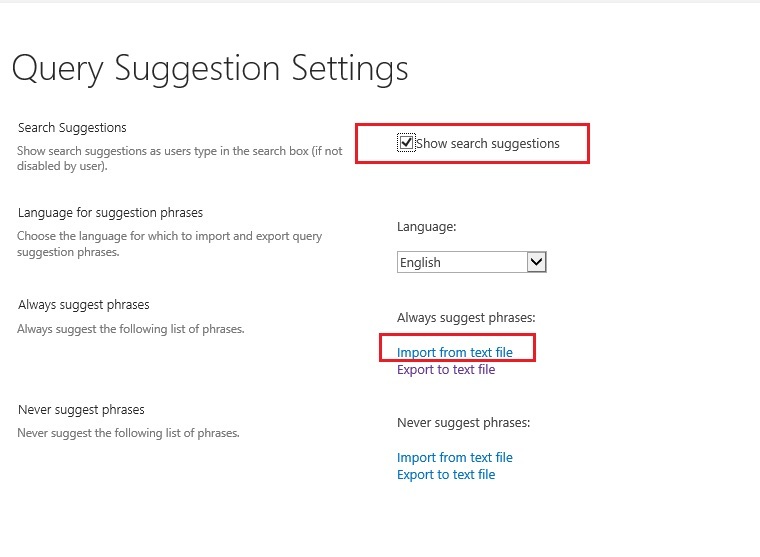 The Query Suggestion feature needs to be enabled at the Service Application level to be activated.Once this is done there are 2 ways to implement query suggestion. 1. 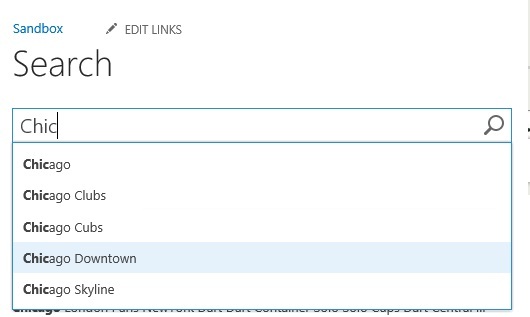 Manually upload the query suggestion list into SharePoint. 2. The search system automatically creates suggestions for a query when users have clicked one or more of the results for that query at least six times. 1. Browse to Central Administration -> Service Applications -> Search Service Application. 6. In this example, I start typing for the word “Chicago”, all words starting with Chicago is automatically picked up. - In the Key column, enter the term (single or multiple words) that you want to trigger a synonym for when the term occurs in a query. - In the Synonym column, enter the synonym (single or multiple words) that you want to add to the query if the term specified in the Key column occurs in a query. - In the optional Language column, enter the abbreviation for the language for which the synonym should apply. Start the SharePoint 2013 Management Shell. <Path> specifies the full UNC path of the .csv file (the thesaurus) to be imported.Universal Naming Convention (UNC) is a way to identify a shared file in a computer without having to specify (or know) the storage device it is on. 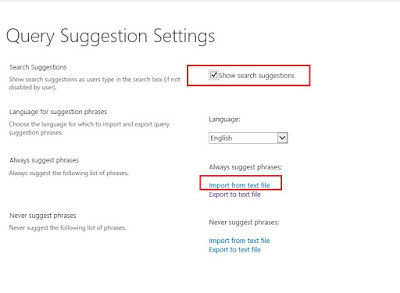 When you search for "IE" you should get results with "IE" and "Internet Explorer"
The Thesaurus feature in SharePoint is associated with the SharePoint Search Service Application. 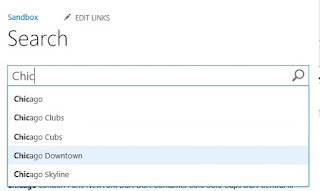 In SharePoint Search if you want to include synonyms also in Search results for specific keywords, you need to import a thesaurus file into SharePoint. Thesaurus file is normally used to specify synonyms for a single word or multiple words that occur in queries. The query is expanded based on the entries in the thesaurus. You create and maintain the thesaurus file in a system external to SharePoint 2013 before you import it into SharePoint 2013 to make the synonyms available to the search system. - In the Synonym column, enter the synonym (single or multiple words) that you want to add to the query if the term specified in the Key column occurs in a query. Synonyms consisting of multiple words will be added as phrases to the query. - In the optional Language column, enter the abbreviation for the language for which the synonym should apply.If you leave this column empty, the query is expanded with the synonym regardless of the query language. 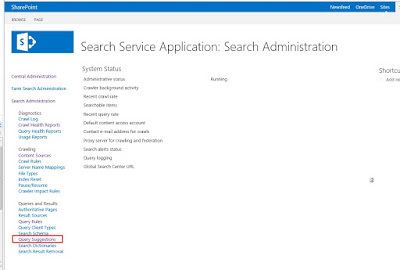 This example retrieves the default content source for the search service application. If you extend the Central Administration web application (using GUI or psconfig command) to run on multiple servers, and when you click on SharePoint Central Administration icon you're still redirected to the first SharePoint server where Central Administration is hosted. The URL has to be changed via registry on all SharePoint servers to fix this. The Get-SPWOPIBinding returns a list of bindings that were created by using New-SPWOPIBinding on the current SharePoint farm. The Remove-SPWOPIBinding removes all bindings on the current SharePoint farm.